Every year, instances of medical malpractice lead to very serious traumatic birth injuries. Cerebral palsy is one of the most common and serious conditions caused by birth injuries occurring during labor and delivery. Although there are many birth complications that can cause cerebral palsy, in this section, our Michigan cerebral palsy and birth trauma attorneys will focus specifically on the forms of birth trauma that cause CP. Trauma is a significant cause of hypoxic and brain injuries during labor and delivery. Traumatic birth injuries can result from the forces of medical personnel or labor itself. We will cover a lot of material related to cerebral palsy and birth trauma throughout this page. Our cerebral palsy and birth trauma attorneys understand that this content can be overwhelming and complicated, so should you have any legal questions or case inquiries, please don’t hesitate to reach out. You can contact our Detroit, Michigan cerebral palsy and birth trauma attorneys online here, by pressing the Live Chat tab, or calling our office toll-free at 888-419-2229. Cerebral palsy is a broad medical term used to describe a number of neurological disorders that hinder movement and muscle coordination. Most people with cerebral palsy are born with the condition or develop it soon after birth as a result of damage to the brain. Cerebral palsy is a non-progressive health condition, so its side effects do not worsen over time. It does, however, have a lifelong and costly impact on affected individuals and their families. Cerebral palsy occurs in approximately two to four out of every 1,000 births in the United States and Europe, according to data from the Mayo Clinic. Cerebral palsy is often due to a lack of oxygen to the brain (hypoxia) at birth, decreased blood flow to the brain (ischemia), or trauma and hemorrhage, which can injure the brain tissue and cause hypoxia and ischemia. Spastic cerebral palsy: Accounting for about 80% of all cerebral palsy cases, spastic cerebral palsy is characterized by stiffness and difficulty moving, due to tightness in one or more muscle groups. Patients with this type of cerebral palsy have a hard time moving from one position to another, and have difficulty holding onto and letting go of objects. Athetoid cerebral palsy: About 10% of cerebral palsy cases are of this type. Athetoid cerebral palsy is typified by involuntary movement, slurred speech, difficulty swallowing, inability to maintain posture, and low muscle tone. Ataxic cerebral palsy: Also accounting for about 10% of cerebral palsy cases, symptoms of ataxic cerebral palsy include depth perception problems, distorted sense of balance, tremors, and difficulty with coordinated muscle movements. If your child has been diagnosed with cerebral palsy, we encourage you to seek the counsel of a skilled birth injury attorney as quickly as possible. Often, cerebral palsy is a result of negligent medical care. The nationally recognized attorneys at Reiter & Walsh have been helping children with cerebral palsy in states across the nation for years. The team can determine if your child’s cerebral palsy was a result of medical malpractice, and can help you obtain the compensation your child needs for a secure future. 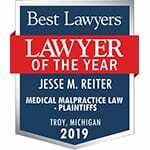 For a free legal consultation, you may call Reiter & Walsh ABC Law Centers toll-free at 888-419-2229, press the Live Chat tab to the left, or complete this online contact form. Inappropriate use of vacuum extractors and forceps can cause brain damage, birth trauma and cerebral palsy through several mechanisms. These include brain bleeds, cerebral contusions, stretching and tearing of blood vessels and brain tissue, compression of the brain with changes in blood flow, and/or skull fractures. Below, we’ll define forceps and vacuum extractors in a bit more detail. Forceps: When a baby is in distress during delivery, forceps, which resemble large salad tongs, are placed on either side of the baby’s head. As each contraction occurs, the physician guides the baby’s head downward and out of the birth canal. Vacuum extractors: A vacuum extractor uses a small, soft cup that is applied to the top and back of the baby’s head. A tube runs from the cup to a vacuum pump that provides suction. During a contraction, the physician pulls or applies gentle traction to the baby’s head while suction from the vacuum assists in pulling the baby’s head out of the birth canal. If forceps and vacuum extractors are used improperly, the damage can be extensive and permanent. If they are applied unevenly to the baby’s head, the strain can cause compression of the head as well as brain bleeds and hemorrhages. Other potential problems with delivery instruments include facial bone distortions, brain swelling, and brain damage which could generate other secondary issues such as seizures, epilepsy, ischemia and cerebral palsy. Similar problems can occur if the suction cup of the vacuum extractor is not placed correctly. The physicians’s technique to pull the baby out is critical, and there should be no twisting of the head or neck, no excessive pulling, and no pulling for more than 10 to 15 minutes. In addition, if the vacuum extractor comes off 3 times during use, the physician should move on to a C-section delivery. Incorrect use of vacuum extractors can result in cerebral palsy, as well as skull fractures, retinal hemorrhages, brachial plexus injuries / Erb’s palsy, brain hemorrhages or bleeds, and seizures. Trauma, forceps or vacuum extractors can also cause the formation of blood clots inside blood vessels, leading to strokes and cerebral palsy. Sometimes during labor and delivery, trauma to the baby’s head occurs, causing intracranial hemorrhages or brain bleeds. Sometimes, the hemorrhages are very serious and result in permanent brain damage, cerebral palsy, and even death. Intracranial hemorrhages (brain bleeds): Intracranial hemorrhage refers to any bleeding within the skull or brain. There are several types of brain bleeds that can cause cerebral palsy, and they are listed below. Cerebral hemorrhage: This is a form of stroke where bleeding occurs within the brain itself. Subarachnoid hemorrhage: This occurs when there is bleeding in the subarachnoid space, which is the area between the innermost two membranes that cover the brain. This type of hemorrhage usually occurs in full term babies and produces seizure activity, lethargy and apnea. Intraventricular hemorrhage: This is bleeding into the brain’s ventricular system, where spinal fluid is produced. It is the most serious type of intracranial bleeding and is usually seen in premature infants and infants with low birth weight. This is because blood vessels in the brain of premature infants are not fully developed and so very weak. Intraventricular hemorrhages can result from physical trauma during birth. Subdural hemorrhage or subdural hematoma: This occurs when there is a rupture of one or more blood vessels that are in the subdural space – the area between the surface of the brain and the thin layer of tissue that separates the brain from the skull. These ruptures are usually caused from difficult deliveries. Seizures, high levels of bilirubin in the blood, rapidly enlarging head, a poor Moro reflex, or extensive retinal hemorrhages (bleeding of the vessels in the retina) sometimes occur with these kinds of hemorrhages. Cephalohematoma: This is bleeding that occurs between the skull and its covering, starting as a raised bump on the baby’s head. It occurs a few hours after birth and lasts anywhere from 2 weeks to a few months. In these cases, the physician must closely monitor the baby for fetal distress and give the mother the option for a C-section. Informed consent is imperative. If fetal distress occurs and normal methods of delivery are unsuccessful, an emergency C-section is required to minimize the risk of intracranial hemorrhage and cerebral palsy. As discussed above, severe head and brain trauma to newborns can occur from medical intervention during labor and delivery. Improper use of delivery instruments, such as forceps and vacuum extractors, are well-documented as causes of intracranial bleeding. In addition, improper delivery techniques (excessive twisting or pulling of the infant’s head) can cause intracranial hemorrhages. Additionally, premature babies are at a higher risk for intracranial hemorrhages due to the fragility of their under developed blood vessels. Approximately 20% of premature infants weighing under about 3.3 pounds suffer intracranial hemorrhages. Trauma causing brain injury can also occur from the cumulative effect of prolonged periods of contractions and pushing. Forcing the baby’s head and brain repeatedly against the mother’s pelvis can happen in cases of cephalopelvic disproportion and macrosomia. Pitocin (also called Oxytocin) often is used in this scenario in an attempt to avoid a C-section. The drug misoprostol — distributed under the brand name Cytotec — also is used to induce labor. It works by ripening (thinning or causing effacement) the cervix and producing contractions. The drug has serious risks, however, which include uterine rupture, hemorrhage, and amniotic fluid embolism (amniotic fluid enters the mother’s bloodstream, causing a stroke). The dosage and method of administering Cytotec raises safety concerns. Unlike Pitocin, Cytotec is a pill that is inserted vaginally. The pill is typically cut into quarters with one quarter inserted every four hours. However, this drug can affect every pregnant woman and baby differently, and there is no way to predict how they will tolerate Cytotec. If the mother or baby has an adverse reaction to the drug, it cannot be rapidly discontinued like other labor induction drugs (e.g., turning off an IV or removing a vaginal insert) since the medication is absorbed into the body. In recent years, there have been concerns over the number of birth injuries that have occurred in cases where Cytotec was used for labor induction. Like Pitocin, Cytotec causes hyperstimulation that can cause serious heart rate changes in the baby. When hyperstimulation is evident, there is a danger that the umbilical cord is being compressed and the baby is not receiving enough oxygen. This causes trauma to the baby and is an obstetrical emergency which requires an immediate C-section delivery to hopefully avoid hypoxic ischemic brain injury and cerebral palsy. Uterine rupture occurs when the excessive contractions associated with hyperstimulation cause the uterus to tear, either partially or completely. The baby then must be delivered by an emergency C-section in an attempt to avoid hypoxia, ischemia, trauma and cerebral palsy. The Committee Opinion of the American College of Obstetricians and Gynecologists (ACOG) issued a warning about Cytotec in 1999 that stated that Cytotec has been known to cause uterine rupture in women who have had prior uterine surgery, and that the drug is not recommended for use in patients who have had a C-section or other uterine surgery. The drug also has been associated with increased incidence of hemorrhaging or blood loss, amniotic fluid embolism, meconium stained amniotic fluid, and increased emergency C-section and assistive device deliveries (forceps or vacuum extractors), all of which can cause traumatic injury to a baby and resultant cerebral palsy. A breech birth is the birth of a baby from a breech presentation. Breech presentation occurs when the baby enters the birth canal with the buttocks or feet first, as opposed to the normal head first presentation. Breech presentation presents some hazards to the baby during the process of birth, including the mode of delivery (vaginal versus C-section). Though labor and vaginal birth are possible for the breech baby, certain fetal and maternal factors influence the safety of vaginal breech birth. The majority of breech babies are delivered by C-section. At the beginning of labor, the baby is generally facing either the right or left side of the mother’s back. Delay in descent is a cardinal sign of possible problems with the delivery of the head. Umbilical cord prolapse may occur, particularly in the complete, footling, or kneeling breech. This is caused by the lowermost parts of the baby not completely filling the space of the dilated cervix. When the waters break the amniotic sac, it is possible for the umbilical cord to drop down and become compressed. This complication severely diminishes oxygen flow to the baby and the baby must be delivered immediately (usually by C-section) so that he or she can breathe. If there is a delay in delivery, the brain can be damaged. Because the umbilical cord—the baby’s oxygen supply—is significantly compressed while the head is in the pelvis during a breech birth, it is important that the delivery of the aftercoming fetal head not be delayed. Oxygen deprivation may occur from either cord prolapse or prolonged compression of the cord during birth, as in head entrapment. If this traumatic deprivation of oxygen is prolonged, it may cause permanent brain damage and cerebral palsy or death. Injury to the brain and skull may occur due to the rapid passage of the baby’s head through the mother’s pelvis. Squeezing the baby’s abdomen can damage internal organs. Positioning the baby incorrectly while using forceps to deliver the aftercoming head can damage the brain, spine or spinal cord. It is important for the physician to be knowledgeable, skilled, and experienced with all variations of breech birth. In the U.S., because C-section is increasingly being used for breech babies, fewer and fewer physicians are developing these skills. The skill of the physician, as well as the number of breech births previously performed, is of crucial importance. Many of the dangers in vaginal birth for breech babies come from mistakes made by the medical team. A fetal-maternal hemorrhage is characterized by the loss of the baby’s blood cells into the maternal circulation. This type of hemorrhage takes place in normal pregnancies, as well as those in which trauma is related to a particular pregnancy complication. Normally the maternal circulation and the fetal circulation are kept from direct contact with each other, with gas and nutrient exchange taking place across a membrane in the placenta. Fetal-maternal hemorrhage occurs when this membrane ceases to function as a barrier and the baby’s cells come in contact with and enter the maternal vessels. Up to 30mL of fetal-maternal transfusion may take place with no significant signs or symptoms seen in either mother or fetus. Loss in excess of this may result in a significant loss of blood and oxygen to the baby’s brain, thereby causing cerebral palsy, or even death. Causes of increased fetal-maternal hemorrhage can occur as a result of trauma or placental abruption. If ongoing and rapid hemorrhage is occurring, it is crucial that immediate delivery of the baby take place (if the baby is sufficiently developed). If the hemorrhage has occurred and then stopped, an in-utero transfusion of red cells to the fetus may be recommended to prevent further brain damage and cerebral palsy. Placental abruption occurs when the placenta separates from the uterus before the fetus is delivered. The placenta delivers oxygen and nutrients to the baby prior to birth. A placental abruption can induce extreme bleeding, which can cause shock (severe loss of blood to the mother and baby), which can cause brain damage and cerebral palsy, or even kill the unborn baby. The condition occurs in approximately one out of every 600 deliveries in the United States. If the placental attachment begins hemorrhaging and the bleeding cannot be controlled, a hysterectomy could be required after the baby is delivered. If diagnosis and treatment are delayed, the mother and baby face a great risk of death. Physicians should check for conditions that raise the risk of a placental abruption. Mothers who have had a previous abruption are at risk of having another one. In about 50 percent of these instances, the mother suffers from high blood pressure. Older mothers are more likely to experience an abruption. Placental abruption can be treated with blood transfusions and intravenous fluid replacement. The mother should be carefully monitored for symptoms of fetal distress and shock. The fetus’s heart rate should be electronically monitored to ensure it is neither too low nor too high, and to make sure contractions do not cause an abnormal fetal heart rate. Maternal bleeding or fetal distress may require an emergency C-section. Typically, to protect the mother and fetus, a C-section is the best option. When a baby remains in the womb beyond the natural due date, usually beyond 41 or 42 weeks, there is great potential for traumatic injuries. In general, the longer a pregnancy continues after 40 weeks, the more risks there are to the baby, including cerebral palsy. Research suggests that due to the increase in fetal death and injury at 42 weeks and beyond, it is much safer to induce labor by about 40 or 41 weeks than to allow the pregnancy to continue. Uteroplacental insufficiency: The major risk to a baby comes from the fact that the placenta reaches its maximum size and surface area around 37 weeks. After 37 weeks, its surface area and function gradually deteriorate. This may mean that the placenta is less able to supply sufficient blood and oxygen to the baby. When the placenta is unable to supply sufficient oxygen, it poses an increased risk for hypoxic ischemic injury and cerebral palsy. Fetal Distress/Nonreassuring Fetal Assessment: If a baby is not responding well and is not being adequately oxygenated during delivery, fetal monitoring will be nonreassuring, indicating fetal distress. In post-term pregnancies, there is increased risk of fetal distress and trauma due to the higher incidence of cord compression. It is crucial that physicians pay close attention to fetal monitoring devices. Meconium aspiration/asphyxiation: Sometimes fetal stress and an older gestational age may induce a bowel movement by the baby while in the uterus. Meconium staining (the infant’s skin, umbilical cord, or nailbeds are stained green or yellow) may occur. This generally resolves on its own in time. However, in some cases, the baby will actually inhale (aspirate) the tainted amniotic fluid into its lungs. This may cause trauma to the airway, irritation, airway obstruction, infection, problems with normal lung expansion, HIE, and cerebral palsy. Umbilical cord compression: When oligohydramnios occurs, there is a serious risk of cord compression. This is because the baby and umbilical cord no longer float in the fluid. Instead, the baby’s movements can traumatize the cord, putting direct pressure on it, and cutting off oxygen, blood and nutrients. Macrosomia: A baby can become very large when a pregnancy is post-term. This can make it traumatic to deliver vaginally. This may prompt a physician to use forceps or a vacuum extractor for delivery assistance, which may increase the likelihood of birth trauma to the baby, such as brain bleeds and head injuries. Macrosomia also increases the chances for C-section when labor becomes prolonged due to problems like shoulder dystocia (the baby’s shoulder is obstructed and cannot be delivered normally) or cephalopelvic disproportion (the baby’s head becomes too large to fit through the mother’s pelvis). In fact, C-section delivery is twice as likely in a post-term pregnancy. Reports and medical literature state that even in the case of uncomplicated, single baby pregnancies, it is best to induce labor by about the 40th or 41st week. Similarly, most obstetricians recommend delivery by 41 weeks. The benefits of labor induction include: reduced C-section rates, lower rates of meconium-stained fluid, less fetal heart abnormalities, reduced oxygen deprivation problems, and much more. There is virtually no benefit to prolonging pregnancy beyond 40 weeks and, in fact, strong scientific evidence has shown that any pregnancy beyond 40 weeks of gestation puts the baby and mother at increased risk for health problems. Preeclampsia is a condition that occurs during pregnancy and is characterized by hypertension (high blood pressure) and proteinuria, or the spilling of protein in the urine. Although the precise cause of preeclampsia remains unknown, it more frequently occurs during a first pregnancy. Women who suffer from hypertension, diabetes, obesity and those who are greater than 35 years of age, also are at increased risk for preeclampsia. Preeclampsia is generally classified as being “mild,” “moderate” or “severe.” In many cases, however, a mother with even mild preeclampsia can rapidly progress to a more severe form of the disease. Moderate and severe cases of preeclampsia can adversely affect numerous maternal organ systems, including the kidney, liver and vasculature. Undiagnosed or untreated preeclampsia can also lead to eclampsia, a potentially deadly consequence associated with significant maternal mortality and potentially permanent neurologic injuries, including intracerebral hemorrhage, blindness and cerebral palsy. In cases where preeclampsia is undiagnosed or untreated, the baby can suffer from traumatic injuries. Preeclampsia can cause a decrease in the blood flow from the mother’s placenta to the baby, thereby reducing the transfer of oxygen and nutrients. Thus, in cases of moderate to severe pre-eclampsia, there can be reductions in the amniotic fluid (oligohydramnios), intrauterine growth restriction in which the baby does not grow normally, or placental abruption. In any patient with preeclampsia, prudent management is critical to achieve a good outcome for both the mother and baby. Physicians managing patients with preeclampsia must conduct thorough maternal evaluations, including blood and urine laboratory tests, to continually assess the extent of the disease. It also is essential that physicians refer their patients who suffer from preeclampsia to maternal-fetal specialists, physicians who have special training and expertise in the management of preeclampsia. In addition to carefully monitoring and treating the mother with preeclampsia, physicians must also initiate a regimen of fetal surveillance to determine what effects the preeclampsia may be having on the baby. Such tests typically will include weekly nonstress tests, biophysical profiles and ultrasound examinations to assess the level of amniotic fluid, and to determine whether the baby is growing normally. Because of the extreme risks associated with even mild to moderate preeclampsia, many physicians deliver their patients prior to term. The umbilical cord is the baby’s lifeline. Through the umbilical cord, oxygenated blood and nutrients are transported from the placenta to the baby. Any disruption in normal blood flow and gas exchange through the umbilical cord can lead to potentially devastating and traumatic injuries to the baby, including asphyxia and cerebral palsy. An umbilical cord prolapse, or a prolapsed cord, generally refers to a condition in which the umbilical cord descends or falls ahead of the part of the baby that is being delivered, often referred to as the “presenting part.” Umbilical cord prolapse can result in a sudden and potentially devastating reduction in the supply of oxygenated blood from the placenta to the baby through the umbilical cord. Additionally, umbilical cord prolapse can result in vasospasm of the blood vessels through the umbilical cord, and a prolapsed cord may decrease in temperature. Both of these conditions can significantly impair the transfer of oxygenated blood to the baby. Umbilical cord prolapse is frequently associated with “malpresentation” of the baby. Instead of being in the vertex position, where the head of the baby is at or near the pelvic inlet, “malpresentation” refers to those situations where some other part of the baby, such as the baby’s buttocks or feet, present at or near the mother’s pelvic inlet. Accordingly, whenever a baby is assessed as being in a breech or transverse lie presentation, the physician should be alert to the potential trauma and grave risks associated with the prolapse. Umbilical cord prolapse is also frequently associated with the artificial rupture of the maternal membranes, also known as amniotomy. In many cases, maternal membranes are artificially ruptured before the fetal head is secure in the pelvic inlet. Thus, when the maternal membranes are artificially ruptured, umbilical cord prolapsed occurs. Because of the increased risk of umbilical cord prolapse associated with the artificial rupture of membranes, or amniotomy, the physician should always determine that the fetal head is secure in the maternal pelvic inlet before artificially rupturing membranes. A prolapsed umbilical cord represents an obstetrical emergency, which can quickly result in permanent neurologic damage. Accordingly, the prompt assessment of umbilical cord prolapse is critical to the implementation of appropriate medical interventions, which often include emergency C-section delivery. When an umbilical cord prolapse occurs, the baby will be at extreme risk for suffering trauma and hypoxia, thereby leading to such potentially severe consequences as permanent brain injury, cerebral palsy or even death. In most cases, the cord is about 20 inches long and almost 1 inch in diameter. It usually appears loosely coiled. Inside the cord are two arteries and one vein. The vein supplies the baby with oxygenated, nutrient-rich blood, and the arteries carry de-oxygenated, nutrient-depleted blood back to the placenta. On occasion, the umbilical cord will only have two vessels; one artery and one vein. When the umbilical cord wraps around a baby’s neck 360 degrees, it is called a nuchal cord, or type A nuchal cord. A type B nuchal cord pattern occurs when the cord cannot be undone and ends up as a true knot. Nuchal cords are very common, with prevalence rates of 15% – 34% at term. They may form at any time and then disentangle and possibly reform, or they may persist. In some cases, the nuchal cord causes traumatic injury and leads to ischemia, hypoxia, decreased fetal development and movement, and complicated delivery. Damage occurs because the tightness around the neck restricts blood flow from the neck artery to the head, the blood from the veins gets backed up, and the vessels in the cord get compressed themselves due to the cord being tightly compressed against itself or the baby’s neck. A nuchal cord can cause severe harm to the baby, especially if the cord is tight around the neck, is wrapped around the neck more than once, or where low amniotic fluid permits cord compression. Other potential umbilical cord complications include prolapse and vasa previa (when the umbilical cord blood vessel crosses the cervix under the baby and is torn). In these traumatic circumstances, the baby may experience fetal distress due to decreased oxygen and blood flow. Many times, fetal distress is marked by accelerations or decelerations on the fetal monitor. Nuchal cords have been associated with fetal demise, impaired fetal growth, meconium stained amniotic fluid, and an increased rate of intrapartum fetal heart rate abnormalities leading to an increased rate of operative delivery, and umbilical artery acidemia. They have also been associated with a long-term risk of neurodevelopmental abnormalities, cerebral palsy and birth trauma. A uterine rupture is a potentially life threatening condition for both mother and baby which typically occurs when the forces and stresses of uterine contractions associated with attempted vaginal delivery cause the uterus to tear open, potentially expelling the unborn baby into the mother’s abdomen. In such cases, maternal or fetal death or fetal asphyxia with associated long-term neurologic impairment and cerebral palsy are common consequences, particularly in those cases where the physician fails to appreciate the risk of uterine rupture, or fails to act expeditiously when uterine rupture occurs. Because of the risk of uterine rupture and trauma to the baby, many physicians will not use any medications such as Pitocin or prostaglandins to either induce or augment the labor of a patient who has had a prior C-section. A uterine rupture, or the separation of a surgical scar from a prior C-section, can result in massive maternal hemorrhage and trauma to the baby, and it frequently requires that the mother undergo a complete hysterectomy. Because of the potentially grave and often fatal risks to mother and baby associated with uterine rupture, physicians should closely monitor the labor of any patient who has increased risk factors for uterine rupture. If uterine rupture occurs, maternal hemorrhage must be promptly controlled and the baby must be delivered as expeditiously as possible to avoid hypoxia, ischemia, cerebral palsy and birth trauma. VBAC carries a number of grave and potentially fatal risks, many of which are not fully explained or discussed with the pregnant mother. These risks include the dangers of uterine rupture, a potentially life threatening condition for both the mother and baby, in which the forces and stresses of uterine contractions associated with attempted vaginal delivery cause the uterus to tear open, potentially expelling the unborn fetus into the mother’s abdomen. In such cases, fetal asphyxia, cerebral palsy and neurologic impairment and death are common consequences, particularly in cases in which the physician fails to appreciate the risk of uterine rupture, or fails to act expeditiously when a uterine rupture occurs. Because of these substantial risks and their dire consequences, many physicians have questioned whether VBAC is an appropriate and reasonably safe mode of delivery for patients who have had prior C-section deliveries. Unfortunately, perhaps as a result of inexperience or economic pressures, many physicians encourage their patients to undergo VBAC deliveries and fail adequately to apprise them of the reasonably foreseeable risks and alternatives, including repeat C-section delivery. The treatment for CPD is surgical delivery or C-section. Sometimes it may be necessary to plan to deliver the baby early. When CPD is present, attempts to deliver the baby vaginally will typically cause trauma, which can lead to permanent injuries, such as cerebral palsy. Pitocin/Oxytocin: Physicians may react to CPD by administering Pitocin, which can cause excessive and traumatic contractions, leading to hypoxia, ischemia and resultant cerebral palsy. Continued Labor: Physicians may allow labor to progress for too long. Labor is stressful and traumatic for babies, and when prolonged, it can cause hypoxia and ischemia, which can lead to cerebral palsy. Shoulder Dystocia: When CPD is a problem, babies are more likely to have shoulder dystocia injuries, including Erb’s Palsy, Klumpke’s palsy, or hypoxia leading to cerebral palsy. Prolapsed Umbilical Cord: When there is less room in the uterus, either because of a large baby or a small pelvis, a prolapsed umbilical cord is more likely, which puts the baby at risk for hypoxic injuries, cerebral palsy and birth trauma. Prolapsed umbilical cord, premature birth, hypoxia and infection in the baby all may lead to cerebral palsy and birth trauma. As you’ve learned throughout this page, cerebral palsy and birth trauma often go hand in hand. In order to prevent cerebral palsy and birth trauma, it is crucial for the physician to monitor the mother and baby very closely during pregnancy and around the time of delivery and prevent or treat conditions that can lead to cerebral palsy. Failure to properly monitor and treat the mother and baby is negligence. Failure to follow standards of care and guidelines, and to act skillfully and expediently also constitutes negligence. If this negligence leads to cerebral palsy, it is medical malpractice. For three decades, the experienced cerebral palsy and birth trauma attorneys at Reiter & Walsh ABC Law Centers have been helping families nationwide affected by cerebral palsy. We are one of the only firms in the country that exclusively takes birth injury, cerebral palsy and birth trauma cases, and we have a track record of multi-million dollar verdicts and settlements that attest to our success.